Niagara Falls Home Owner CASTING CALL! for new HGTV Canada series called I Wrecked My House! Are you or someone you know more like MacGyver than Mike Holmes? New HGTV Canada series, I Wrecked My House, hosted by comedian Steve Patterson is looking for un-handy homeowners with an eccentric, unconventional approach to home repairs. Who says you can’t use old crutches to hold up the stairs? Your leg healed, so why not put those crutches to good use. Better yet, how about using a car jack to hold up that beam in the basement? If your go-to tool for home repair is more likely to be a roll of duct tape rather than a screw driver then we want you! Ever use roofing shingles to tile the foyer? Not such a bad idea, considering those shingles have a 25 year guarantee! And why return your empties for a refund? Just punch a few holes in that beer can and it makes for a perfect shower head. Now that’s worth more than five cents! Who says you can’t install used linoleum on the kitchen walls for a backsplash? Why waste good flooring! Or use that trusty duct tape in place of caulking around the bathtub. We want to hear more about these kooky and bizarre approaches to home repair! We’re on an Ontario-wide homeowner hunt to uncover the strangest wackiest, most extreme solutions to home repairs ever seen. Ideal candidates for this series are gregarious, fun loving people who don’t take themselves too seriously and have an aptitude for completely outrageous DIY solutions. By participating in the show, selected not-so-handy homeowners will have a chance to receive a major renovation to their home for FREE. Deadline for submission: Production starts this fall. If you want the chance to receive a major home renovation, please do not delay, apply immediately! 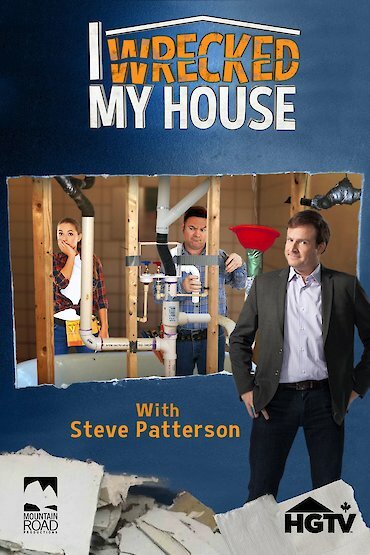 I Wrecked My House is an HGTV Canada series hosted by comedian Steve Patterson that features eccentric, kooky and unconventional approaches to home repairs. The series aired as a 1-Hour Special on HGTV last April and has just been picked up for 14 half-hour episodes that are set to begin filming this fall. The series is a celebration of the completely unique and utterly outside the box approach to home maintenance and we’re looking for un-handy homeowners that take a more MacGyvered approach to DIY fixes in their home.